These materials are best preserved in a moist burial environment. However, they are generally fairly fragile and require consolidation in order to survive storage and display. Conservators consolidate objects in order to make them stronger. The consolidant, usually a synthetic material, helps to support the protein or cellulose molecular structure. 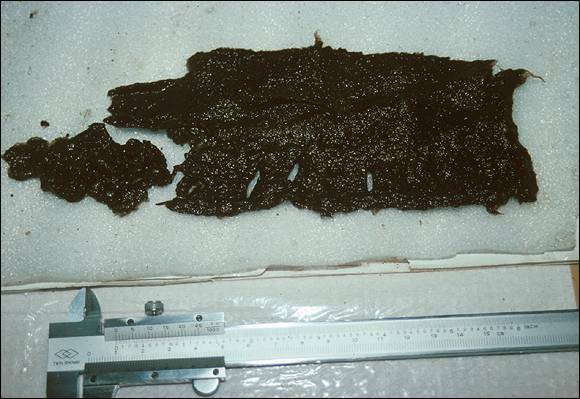 To date, the best preserved organic artifacts excavated at Ferryland were found in the privy or cesspit at the waterfront. Leather shoe fragments, a wheelbarrow, barrel parts, textiles, seeds, twigs and coniferous needles were among the organic materials uncovered at the cesspit. To date, the best preserved organic artifacts excavated at Ferryland were found in the cesspit of the shore station. 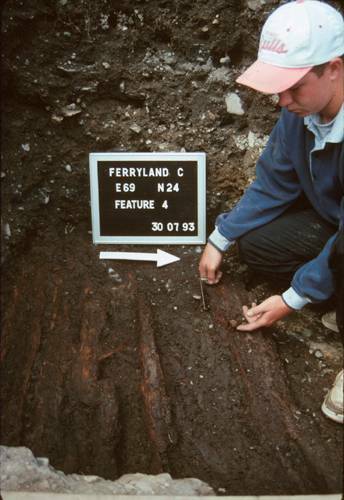 The wood shown below was buried in a wet area of the site. 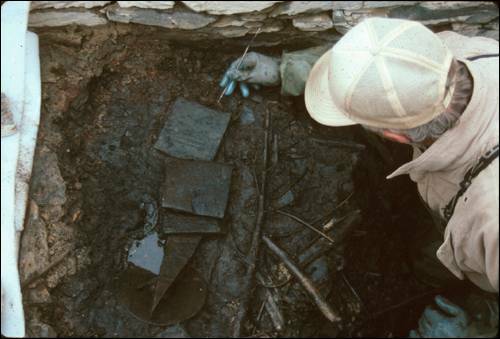 Because moisture levels have remained high since the time of burial, the cellulose structure of this wood was fairly well preserved. Some of the cellulose had deteriorated and over time was replaced by water in the soil. Therefore, when the wood was excavated it was stored in water so that the cellulose structure would not collapse, resulting in shrinkage and warping. At the Memorial University conservation laboratory, the wood was immersed in an aqueous polyethylene glycol solution (a synthetic wax which acts to support the cellulose structure), followed by freeze drying. After this treatment the wood can survive for future research and display.